For those of you living under a rock, or maybe hiding behind Scott Van Slyke’s mustache, the MLB amateur draft starts tomorrow. 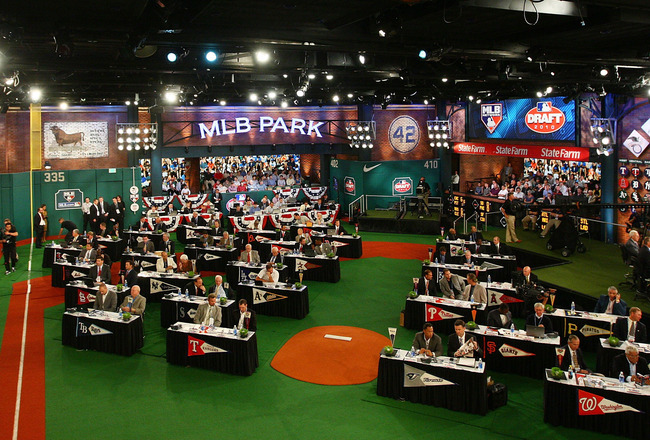 While it lacks the glitz and glam of the NFL draft (thank god), and bust potential is very high with so many picks (where ARE you Tim Beckham? ), it’s still an exciting event for baseball nerds like us. The stars of tomorrow (if you’re Bryce Harper…but more likely the stars of 2016) are all waiting in the wings of this draft. Follow along on MLB Network or MLB.com tomorrow, starting at 6 p.m. EST, to see which young player you need to know as he tears up your farm system over the next couple seasons. So what is this nonsense we are spamming your timeline with tonight? Oh, just the dream team of MLB family genes! Using this article as a reference, we’re picking the all-bloodline team of the prospects who could get drafted this week, purely based on how said family member performed in his career. We probably won’t find the next Barry and Bobby Bonds or either of the Griffey’s, or any of the Boone’s, but it will be fun either way. As much as this Warriors/Dodgers fan wanted to pick Ryan McCarvel (nephew of former NBA first-round pick Chris Mills) or Chad Wallach (son of current Dodgers third base coach Tim Wallach), you can’t deny the exceptional talent that is evident in the Wong family. Kolten is one of the best prospects in baseball, and that alone made this an easy choice. We’ll see if Kean (I’ll give you a bag of corn nuts and a fist bump if you can tell me how to pronounce this name) lives up to his brother’s reputation. I almost went with Manny Ramirez (yes, it’s the dreaded one’s son) here, but word on the street is that he’s joining pops in Taiwan to ensure that the family dominance continues there. That’s a completely made up rumor. But how can you pass on the relative–even if the connection looks sketchy–to one of the greatest personalities and players in baseball history? I mean, the man has a World Series ring for each finger. And, yes, he has all 10 fingers. If Cameron is even one-fifth as successful, somebody made a good draft selection. Dad joined the 3,000 hit club, retired, and was immediately left out of the Hall of Fame this year. I’m over that. Totally. Can’t you tell? Anyway, I’m less concerned about why Craig named his son “Cavan,” than I am about the offspring actually matching Dad’s success. It’s a tall order, but even if he plays good defense and is a HBP magnet, we’ll be saying “like father, like son.” Too bad the ‘Stros already have a franchise second baseman. It would have been nice to see that name on the back of an Astros uni again. To be honest, I was never a huge follower of Pat Borders’ career. I knew who he was and it seemed like he was around forever. So at the very least, if Luke can give that longevity, he’s worthy of this spot. His dad was extremely average, but enjoyed two rings and some good years defensively in Toronto. And with all apologies to Ruben Amaro and his hot-corner-handling nephew, I had to give the ‘stache potential points to the Jones family in the honorable mention category. Imagine my disappointment when I found out Jay Buhner’s son Gunnar qualified here but was not the kid on the epic SI cover shot. He gets the axe. We already gave JJ Franco, who can play both middle infield positions, an honorable mention elsewhere. And as much as I like BJ Surhoff (nephew Colin Moran is the #6 prospect in the draft and has an outside chance to go first overall), the rest of the group is better. Carl Crawford’s cousin J.P. is hanging around, but won’t quite make the cut. And because Walt Weiss has too many w’s in his name, his son Brodie is out (sorry not sorry). It’s simple subtraction, people. Plus, Jamie Moyer rules. Topping his older brother’s first at-bat heroics is not going to happen, but Jacob could eventually become an All-Star and Gold Glove winner, too. Maybe the Braves can just move Jason to centerfield and replace another member of a brotherly duo in B.J. Upton, with the younger J-Hey. But if Braves GM Frank Wren has his choice between another Heyward and either of his sons, will he really slap family in the face like that? Spoiler: he definitely should. Anyone else not realize until now that Torii Hunter was Torii Hunter, Sr.? The only reason I chose baby Torii over the bloodline of a Hall of Famer (see: Yount, Robin) is because there is a more direct DNA track between the two. If Hunter, Jr. is even a shell of his father, the team that drafts him is not going to be sorry. Hunter, Sr. has been one of the elite outfielders in baseball for almost two decades, and has been a helluva hitter as well. Please don’t tell Paul O’Neill that his nephew is merely an honorable mention for this position. But…really? What do you want me to do? NOT start a relative of the great 19-time All-Star? I don’t care how good this Mike kid is — if the Red Sox draft him, people are going to go absolutely nuts in Boston. But now that I jinxed him, the Yaz of the younger variety is probably going to get picked up by the Yanks. Uh-oh. There were plenty of good options for the rotation, and you can see how clotted the bloodlines are (I should really work on that word choice) if the Leiter and Pettitte families get snubbed. Despite any steroid allegations, you can’t ignore the Clemens family dominance at the top of the rotation, followed by the studly southpaw in Saberhagen (really the only lefty worthy of consideration). Even though Killebrew and Stargell were hitters–very, very good hitters–it made sense to include their relatives here, as both are in the Hall of Fame. And naturally, even if he can never live up to big brother’s successes, leaving the name “Verlander” out of the starting rotation would be blasphemous. As far as I know, all the pitchers on the list are starters anyhow, but I had to find a way to get Gary Sheffield’s DNA into this group. I’m just imagining his nephew Jordan having a violent arm waggle when he’s in the stretch before a pitch. With the violence that uncle Gary played with, I expect Jordan to at LEAST touch 123 MPH on average with his fastball. Really, Quantrill or Hunter Brothers (Rockies’ reliever Rex’s little bro) would have been the more sensible choice, but it’s GARY SHEFFIELD, people! What do you think? Will any or all of these guys get drafted today? Who would YOU include on your all-bloodlines team for this year’s draft? 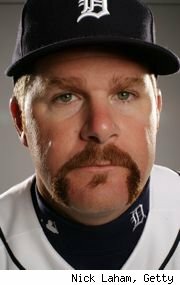 Did I include too many mustache pics in this blog? Follow along with Three Up, Three Down on Facebook or tweet us @3u3d with input.